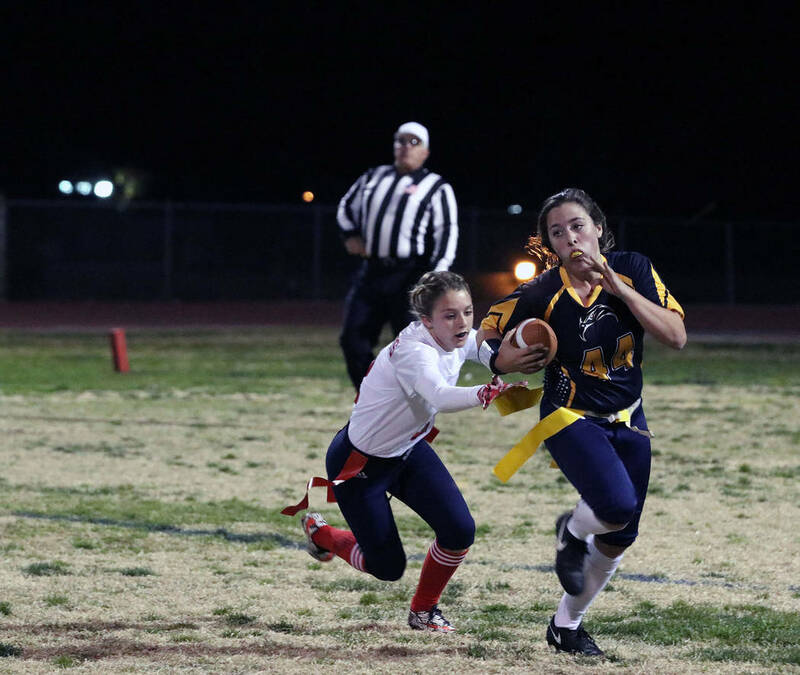 Unable to capitalize on potential scoring drives, Boulder City High School’s flag football team concluded its season Feb. 15 with a 24-0 first-round playoff loss to Cheyenne. File Senior Nikki Meleo, seen during Boulder City High School's Nov. 29 victory against Liberty High School, led the Lady Eagles with nine tackles, along with 43 rushing yards on five carries and five catches for 39 yards during their 24-0 loss to Cheyenne in the first round of postseason playoffs on Thursday, Feb. 15, 2018. The Lady Eagles finished the year 8-8 after running their playoff streak to five consecutive seasons. Driving inside the Desert Shield’s 20-yard line four times, the Lady Eagles’ offense, like it had most of the year, failed to put points on the board. It’s an issue Ruth vowed the program would shore up moving forward. Ending their prep careers on a high note with the Lady Eagles despite the loss, seniors Nikki Meleo and Hannah Barth left it all out on the field. A two-way star, Meleo led the Lady Eagles with nine tackles, while adding 43 rushing yards on five carries and five catches for 39 yards. Barth contributed seven tackles defensively and one catch for 10 yards on offense. Shifting their focus away from their playoff woes and toward the future, Ruth said the program is heading in the right direction, given how many underclassman played this season. Giving the Lady Eagles building blocks for the future, junior playmaker Ryann Reese (three tackles, 15 rushing yards, 11 receiving yards) proved a great addition in her first season. Juniors Elizabeth Taggard (three catches, 23 yards) and Haley Jackson (three catches, 24 yards) are also expected to return. Showing signs of growth late in the season, sophomore quarterback Makaela Perkins (7-of-14, 54 passing yards, 34 rushing yards) will also return, along with freshman two-way player Kamry Bailey.